Users must have a Harmony Server account with a password in order to access WebCC. You can create a user account and assign them a password in the Manage Users panel. NOTEUsers created in the Control Center application have a Harmony Server account, but do not have password to their account. They must be assigned a password before they can use their account to log in to WebCC. Until then, they only have access to the Harmony Server database through Harmony applications ran from the local network of the server. 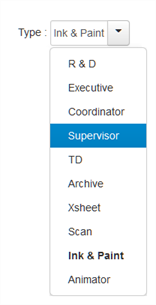 From the top menu, select Admin > Manage Users. In the upper-right corner of the Manage Users screen, click Add User. 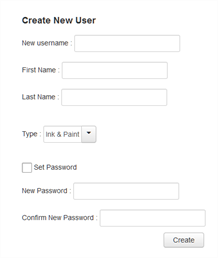 The Create New User form appears in the right panel. In the New username field, enter the desired username for the user. This will be used by the user to log in to WebCC. In the First Name and Last Name fields, enter the user's first and last names. In the Type drop-down menu, select the user type to define the type of work the user typically performs. This will determine the permissions the user has on assets in the Harmony database—see User Types and Restrictions in WebCC. The password must be at least eight (8) characters in length. The password must contain at least one capital letter, other than the first character of the password. The password must contain at least one digit or non-alphabetical character. In the Confirm New Password field, retype the password to confirm it. The name appears in the user list. In the user list, select the user to which you want to assign a password. The Editing Username form appears on the right. The user will be able to log in to WebCC using their username and newly created password.